Young athletes who will compete in the finals of the School Games in London this summer have attended a reception at 10 Downing Street. 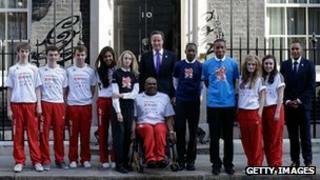 Scheme ambassadors Darren Campbell and Ellie Simmonds were among those at the event hosted by Prime Minister David Cameron and the Princess Royal. International Olympic Committee (IOC) president Jacques Rogge was also at the event for talks with Mr Cameron. It marks the start of the IOC'sfinal inspection ahead of the 2012 Games. Speaking at a press conference where he welcomed inspectors from the IOC, Mr Cameron said London 2012 would provide a lasting legacy to improve Britain's sport, health, culture and economy. Promising "great sport, great culture, great business and great legacy for Britain", Mr Cameron hailed the efforts to encourage young people to get involved in sporting events including the School Games. Nearly 8,000 schools, 1,600 competitors, 12 sports, four Olympic venues - elite sport stands atop a broad pyramid and Britain's future sporting hopes could depend on the success of the School Games. That is a big claim for what should be a lot of fun but with attempts to find a tangible sporting legacy from London 2012, expectations are high. Some had hoped to call this event the School Olympics but when that proved impossible, and funding for other projects disappeared, it became school sport's main Olympic legacy. There is a problem with elite sport, though, it is exclusive. Squaring that with a sport-for-all ethos will be an Olympic challenge. He said: "Getting half the schools in the country to take part (in the School Games) is a particularly good achievement and powerful stuff." Olympic heptathlon champion at the 2000 Games Denise Lewis, former Olympic sprinters Darren Campbell and Jason Gardener and double Paralympic swimming gold medallist Ellie Simmonds, have all been named as School Games Ambassadors. They were joined at the reception by 12 young badminton and table tennis players who are due to compete at the inter-schools tournament in May. The finals of theSchool Games,which aim to mirror the Olympics and Paralympics, will have their own opening and closing ceremonies and will be watched by 35,000 people. About 1,600 children will compete in events at the Aquatics Centre, Velodrome, ExCeL Centre and the Olympic Stadium between 6 and 9 May. The youngsters will take part in athletics, swimming, cycling, fencing, rugby sevens, gymnastics, hockey, badminton, judo, table tennis, volleyball and wheelchair basketball. Simmonds told the BBC how important the School Games had been in her career: "For me in 2006 it was the first place I went to when I was away from home, I was only 10, 11. "It gave me really good preparation for a multi-sport event and being in a team. I really enjoyed it, I loved it. "This year getting the School Games in to see the (Olympic) venues is amazing." Campbell said "legacy" around the Olympic and Paralympic Games was "normally just a word being used". But, he added: "The opportunity for 1,600 of the most talented young people to compete in Excel, and then on the 9th to go into the Olympic Park will take them on the journey from youngsters, taking it to the next stage and hopefully competing on the Olympic stage. "That's where you decide as a young person whether it's really for you. "I remember being 15 and going to the Youth Olympics in Belgium, the first time I'd been abroad, having to compete against the best youngsters from across Europe." Culture Secretary Jeremy Hunt said: "The School Games Ambassadors are a hugely talented group of people with an amazing range of sporting achievements between them. "They really are inspiring role models for all the children competing." Gold medallists from the 393 final events will receive a ticket for an Olympic or Paralympic event. The School Games, which is supported by a £10m funding package from Sainsbury's and more than £152m of Lottery and Government money, is designed to rejuvenate competitive sport in schools.